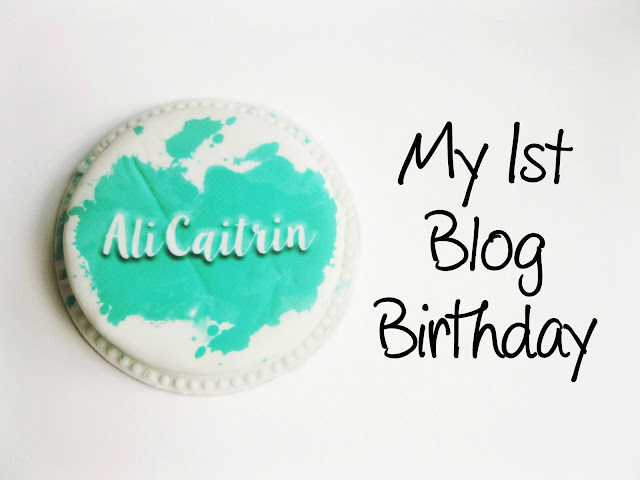 It’s official, I’ve been blogging on Ali Caitrin for over a year now! How crazy is that? Weirdly enough I thought I would be very much like “Oh it seems like it was only yesterday that I started my blog” yet it honestly doesn’t because if anything it feels like I’ve been doing it for years! I know I’ve got a lot more to learn don’t get me wrong, what I mean is now blogging has become such a big part of my life it comes more naturally to me which of course is a relief haha! Anyway I thought in celebration of my blog turning 1 yesterday I would do a quick post letting you all in on how it all began and maybe learn a little bit more about me so I should probably get started before I go waffling on! I had been reading blogs for ages and it was always in the back of my mind that I should start a blog of my own. I had so much that I wanted to talk about but I didn’t put it into action if that makes sense? Well it wasn’t until a couple of my friends convinced me to get started that I actually done it! 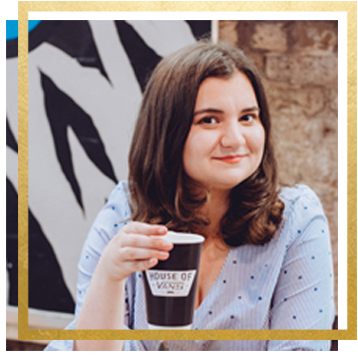 I’ll let you in on a little secret too – I set up my blog around July 2014 but I didn’t actually publish my first post till a couple of months later because I was so nervous to click publish.. silly me haha! Where did the name ‘Ali Caitrin’ come from? It’s quite simple really, Ali is my name (obviously) and Caitrin is my middle name so I just linked them together for my blog name. I’m sorry there’s no magical story behind it but it really is that straight forward! Also I thought I would give you a little help on pronouncing it. Yes Ali is pretty simple to say though I have wondered if my readers know how to actually say Caitrin? It’s pronounced ‘Kah-trin’ for those wondering anyway! I think with it spelt with a ‘C’ it kind of confuses people, whoops! Was starting a blog all you thought it would be? Yes and no. It’s more fun than I thought it would be, I didn’t think I would meet so many amazing bloggers from it and the experiences I’ve gain from blogging is just unreal! One thing I didn’t realise till later on was there’s more to blogging than people think. It’s hard work at times especially if you’ve set yourself certain goals. In my opinion you’ve got to experience blogging to see how much blood, sweat and on the occasion tears it takes to make a blog stand out from the rest. It’s worth it though! Do you have any blogging goals you want to achieve? I did set myself a few blogging goals but nothing really serious. It was just things like to improve my photography skills and learn more about SEO, that kind of thing! At the moment I don’t want to put too pressure on myself to blog in a certain way. I’m loving how my blog has turned out from when I first started and I want to keep it like that! Would you ever consider doing your own YouTube channel? I highly doubt it haha! It’s not something I’ve ever thought of doing and to be honest it’s not what I want to get into either. I LOVE watching YouTube videos but doing them yourself is a whole different kettle of fish so I’ll stick to blogging. Do you have any regrets about blogging? You want an honest answer right? Well it’s a no. I don’t have any regrets! That’s probably such a cliché answer but it couldn’t be more true! Even the small mistakes I have made which aren’t that bad anyway meant that I learnt from it and you can’t be perfect so I’m okay with that. What advice would you give to those wanting to start their own blog? Just go for it! It’s easier said than done but you won’t know unless you try. Also don’t worry about not knowing a lot about blogging before you start. You could read 100 books on how to blog but it’s like starting a new job, the majority of what you do you’ll learn as you go! Tell us something we don’t know about you already. Oo this is a difficult one actually. Okay I’ve got one! When I was little, I’d say maybe about eight years old, my family and I went out for the day and we decided to get our faces painted! You know most kids choose cute things like a butterfly or a tiger, guess who I picked? It was Darth Maul. That’s right, I choose to walk around for the rest of the day with my face painted like the evil guy from Star Wars haha! If you don’t know who that is, google it now and I hope it makes you laugh! Now I think it’s time for a late lunch snack so I’m going to finally have a slice of that wonderful cake you might have noticed on that photo up there! Let me explain – I recently won a blog competition that the gorgeous Rhiân from Chapter and Circle had running on her blog to get a free personalised cake from Bakerdays. As you can see, I went for my blog button as a cake, I know I know another cliché thing to do but it came just in time for my blog birthday so I couldn’t not right? Well I’m off now to have some vanilla goodness so I’ll see you soon and again, thank you all so much for your support! Congrats huni!!! I look forward to following your journey for many years to come! Congrats on your blog birthday – belated congrats! 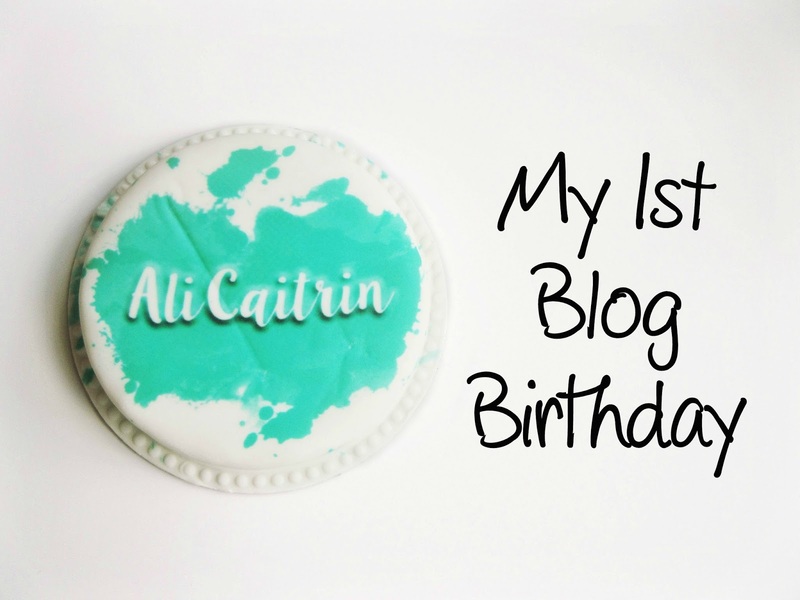 Happy one year blogiversary Ali! It was nice to read a bit about you and your blogging story 🙂 Looking forward to all the future blog posts you'll cook up for us!